This article is about the town in England. For other uses, see Wickford (disambiguation). Wickford is a town in the south of the English county of Essex, with a population of more than 33,000. Located approximately 30 miles (50 km) east of London, it falls within the Borough of Basildon along with the original town of Basildon, Billericay, Laindon and Pitsea. 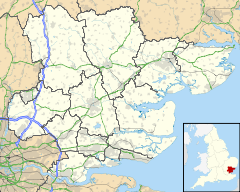 However, parts of Wickford fall under neighbouring districts such as Chelmsford and Rochford. Wickford has become a commuter town, serving the City of London through its railway station's direct connection to Liverpool Street station through the Southend Victoria line, on which a train to London takes approximately 40 minutes. The town can also be easily reached via the road network by the A127 between London and Southend-on-Sea or by the A130 from Chelmsford. Wickford is a fairly small town with a main high street including a range of shops. It also has a swimming pool, library, open-air market and a community centre within the vicinity of the town centre. Wickford also incorporates a small estate called Shotgate, which is home to many residents. Shotgate features a row of village shops and a children's play area and park. In August 2018 a group of residents began petitioning to create a Wickford Town Council in order to give residents a stronger voice on local matters. Wickford has a history going back over two thousand years. There is evidence that the area itself was inhabited in prehistoric times probably by a tribe of Britons called Trinovantes. There was a Roman military marching camp on the Beauchamps Farm site, which was succeeded by a Roman villa. This is now the site of Beauchamps High School. This area on higher ground was the historic core of Wickford, the site of the manor house and the parish church of St Catherine's. Over time the commercial centre of Wickford has migrated westwards, towards the modern High Street on the other side of the River Crouch. The place-name Wickford is first attested in a Saxon charter of 995, where it appears as Wicford. It appears in the Domesday Book of 1086 as Wincfort. The name means 'ford by a wych elm or ford by a dairy-farm'. Before the 20th century Wickford was an agricultural village. At the time of the Domesday Survey, six land-holders were recorded. Historically there have been only two considerable estates in Wickford, the manor of Wickford Hall and the manor of Stilemans. Robert Wikeford or de Wickford (1330–90), Archbishop of Dublin, was born in Wickford, and his family are thought to have been Lords of the Manor of Wickford Hall. The village of Wickford in Rhode Island, United States, is believed to have been named after this town. Wickford was also the English birthplace of Elizabeth Reade (1615–72), the second wife of John Winthrop the Younger (1606–76), Governor of Connecticut, and a step-daughter of Hugh Peter (1598–1660), a prominent supporter of the Parliamentary cause during the English Civil War. Wickford became the birthplace of Naturism in the United Kingdom: in 1924 the English Gymnosophist Society was formed and had its home in the town. During the Second World War the edge of the town was hit by a German doodlebug, and on 6 December 1944 a V-2 rocket fell in Branksome Avenue, about a mile west of the town centre. Around the town, in amongst the hedgerows and fields, there are numerous pillboxes constructed as a part of British anti-invasion preparations. In 1958 Wickford town centre was hit by a flood which made national news headlines. The most striking image of the flood was a double-decker bus, left stranded at Halls Corner overnight, partly submerged by the floodwater. A second flood in 1960 meant changes to the course of the River Crouch were made. This included turning the river into a concrete channel through the centre of the town, although this may be removed in the coming years, depending on the scale of the Wickford Masterplan (see below). The River Crouch flows through Wickford in a concrete bank designed to protect the town from flooding. For the most part, Wickford is flat and 10 metres (33 ft) above sea level. The highest point, on the outskirts of the town, is 74 metres (243 ft) above sea level. The River Crouch flows through the town, from the west to the east. The River Wick flows into the River Crouch from the south. The Wick Country Park comprises 50 acres (20 ha) of former agricultural land, with over 2 km of easy access trails around the site. The trails leads visitors past old hedgerows, the 5-acre (2.0 ha) lake, ponds, World War II pillboxes and recent woodland plantings, with bridges and boardwalks that allow the trails to continue over the North Benfleet brook. The Wickford Masterplan was first unveiled at the Wickford Community Centre in December 2004 and published in November 2005 by DTZ Pieda Consulting, at a budget of £125 million, and many of the developments are currently in progress. At the heart of the proposals is the redevelopment of the High Street, which will be redesigned to be the town's premier meeting place. The Masterplan would create new public spaces, enhance the retail environment through the renewal of retail floor space and bring the market into the street scene, promoting urban living above shops and on the existing market site. Adjacent to the River Crouch, a number of high quality residential developments promoted as the "Town Centre Riverside Living" complex would revitalise the riverside as a public asset and promotion of new eating and drinking opportunities. In addition, a new residential development to the west of Market Avenue will be constructed. Promoting the station entrances on both sides of the railway line as key gateways to Wickford are also key areas of the plan, which would enhance transport interchange facilities and bring forward the car park site on Station Road for development as a new multi-storey car park and mixed-use development. As of present only the northern side of the station facing The Broadway is easily accessible, with the southern London-bound track only accessible from the outside though a small out-of-way footpath from Market Avenue as a courteous entrance for wheelchair-using passengers. Public and health services would be improved under the scheme, with the re-organisation of existing health, library and community services into a new 'iconic' building to the east of Market Avenue as an integrated community service facility. The Eastern Extension would create a better presence and new linkages to the east of the town centre by redeveloping the car park into a multi-storey development with residential and live-work uses and a new housing scheme to the east of Wickford Bypass. The Southern Gateway area, which surrounds London Road and the southern end of the High Street, are also planned to undergo a transition with a strong leisure and recreational theme, building on existing eating and drinking facilities and incorporating compatible residential uses. Overall 650 apartments are planned to be built as part of the Masterplan as officially stated by councillor Tony Ball, although other sources opposed to the project claim this figure is closer to 735. The Masterplan has met with resistance with many residents of Wickford, mainly due to overall cost, and also the fear from some older residents that raising the level of the river could see repeats of the floods in 1958 and 1960. There have also been criticism over the number of developments being constructed, which some say threaten to overdevelop and cause environmental and aesthetic damage to the town centre whilst providing minimal improvements to public services; one such group is the Wickford Action Group who has campaigned against many of the revisions made prior to the public approval of the plan. Construction began in earnest in February 2007, which saw the demolition of many of the buildings in Lower Southend Road to make way for a new residential area. As of December 2009 this development has been partially completed (Riverside Place phase 1 + Riverside Court), however the compulsory purchase order of the post sorting office has been withdrawn leaving the fate of Riverside Place Phase 2 in doubt. As of April 2010, the whole of the Masterplan project is facing serious delays and construction has halted due to the global financial crisis. In May 2009 the construction company Bradgate Developments released a statement assuring residents the project was still on track. The plans by the previous Labour government to build on land near the Runwell Hospital mental institute a prison capable of accommodating up to 1,500 inmates have since been shelved. The land is now earmarked for housing which is scheduled to start early 2016. Robert Wikeford or de Wickford, (1330–1390), Archbishop of Dublin, was born in Wickford, where his family are thought to have been Lords of the Manor of Wickford Hall. Chantelle Houghton, winner of Celebrity Big Brother 2006 lives in Wickford. Capital Radio Afternoon DJ Chris Brooks lives in Wickford. Southend United's previous manager Steve Tilson. Comedy Actors/writers Rhys Thomas and Tony Way are both from Wickford. Tony Stockwell – A British author, television personality and psychic medium. Jon Morter (notable for the Rage Against the Machine and The Justice Collective UK Christmas No.1 singles) used to run a Rock music night in Wickford. ^ "Town population 2011". City Populations. Retrieved 7 September 2016. ^ Rayment, David (17 October 2013). Wickford and Around Through Time. Amberley Publishing Limited. ISBN 9781445632254. Retrieved 18 November 2015. ^ Eilert Ekwall, The Concise Oxford Dictionary of English Place-names, pp. 516 and 515. ^ Edwards, Adam (9 May 2006). "Stark naked ambition". Daily Telegraph. ISSN 0307-1235. Retrieved 2 February 2019. ^ "Wickford Masterplan 2005". Basildon Council. Retrieved 30 December 2009. ^ a b "Basildon Council accepts sole bidder for Wickford masterplan tender". Echo. 23 April 2009. Retrieved 30 December 2009. ^ "Masterplan – the current total". Wickford Action Group. Retrieved 15 February 2010. ^ "Fears for Wickford". Echo. 26 March 2007. Retrieved 15 February 2010. ^ "Wickford Masterplan may be put back again". Echo News. 23 January 2009. Retrieved 12 March 2009. ^ "WICKFORD: Builders vow flats plan will go ahead". This Is Total Essex.co.uk. 12 May 2009. Retrieved 12 March 2009. ^ "WICKFORD: 1,500-man jail to be built at hospital". This Is Total Essex.co.uk. 29 April 2009. Retrieved 15 February 2010. ^ "BILLERICAY AND WICKFORD: Titan prison could open on your doorstep". This Is Total Essex.co.uk. 17 December 2008. Retrieved 15 February 2010. This page was last edited on 16 April 2019, at 13:00 (UTC).